What is a P-20 STEM (Science Technology Engineering Mathematics) Council? A community forum that provides P-20 leadership, resource development, and issues management in a systematic and strategic fashion. It ensures that all STEM programs and initiatives meet the highest and most rigorous standards and help provide a seamless educational experience for students. The Council does not develop new programs but rather enhances and links existing successful practices. Why do we need one now? Although the number of STEM positions available in the work world is growing at five times the rate of other occupations, student achievement in math and science is declining. We are also experiencing a very critical shortage of qualified math and science teachers. 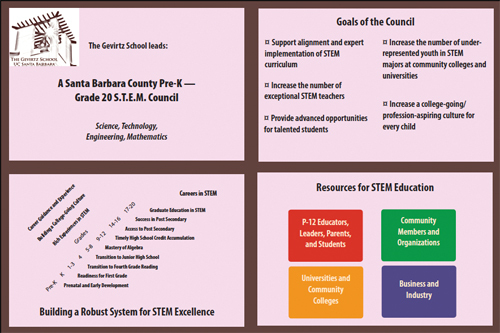 The Council tackles achievement gaps in student learning and access to advanced STEM experiences; for instance, the rate of college entry among Santa Barbara County's Latino students, including to two-year community colleges, is just 23%.